« Where Are Homes Selling The Fastest In St Louis? One year ago today, the small city of Ferguson gained international attention after Ferguson Police Officer Darren Wilson shot and killed Michael Brown, an incident which spurred weeks of violence and property destruction in Ferguson. This delivered a blow to the Ferguson real estate market which was, at the time, already struggling to recover from the housing bubble burst in 2008 which had severely impacted the area. 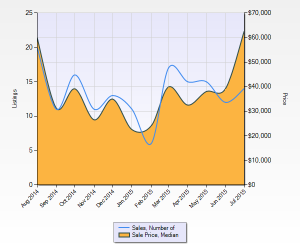 Now that a year has passed, I wanted to see how the real estate market in Ferguson was doing. As the chart to the right shows, the median days on market for homes for sale in Ferguson shot up immediately after the shooting. 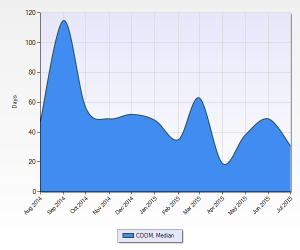 Since then the trend has been downward and last month the time had dropped back to slightly below a year ago. As the chart to the right shows, the median price of homes sold in Ferguson dipped but have risen back to $62,500 for July 2015, slightly higher than at the time of the shooting when the median price was $60,000. 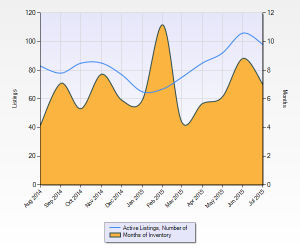 The number of sales has dropped slightly from 16 last July to 14 last month. As the chart to the left shows, the inventory and supply of homes for sale in Ferguson has increased over the past year. Last August there was a 4 month supply of homes for sale in Ferguson and last month there was a 7 month supply. Despite the fact that nationally foreclosure activity dropped 2.65 percent for the first half of 2015 compared to the first half of 2014, Ferguson saw an increase of 15.79 percent in foreclosure filings during the same period. When we compare the first of 2015 with the last half of 2014, Ferguson had an increase of 72.55 percent in foreclosure activity while, nationally, foreclosure activity declined 12.51 percent. At the time of the shooting, over 50 percent of the homeowners in Ferguson were underwater, or in a negative equity position, meaning the balance of their existing home mortgage exceeded the value of their home at the time. During the second quarter of this year, underwater homeowners in Ferguson fell to 42.9% of all homeowners.